The bright surface of Vesta – an asteroid so huge that some researchers consider it a dwarf planet or protoplanet – is peppered with carbon materials that are likely from "dark" asteroids that gently hit the surface, according to a new study. It's the first time researchers have found such extensive evidence of this type of asteroid material across a large body's surface. The study seeks to explain a curious pattern of materials that researchers saw in observations from the Dawn spacecraft, which orbited Vesta between July 2011 and September 2012. "The earliest images we had of the surface — shortly after going into orbit — were sometimes spectacular examples of very bright and very dark material on the surface," said researcher Tom McCord of the Bear Fight Institute, a science research facility in Washington state. McCord is the lead author of a study reporting the findings that will be published in the Nov. 1 issue of the journal Nature. Researchers looked at three scenarios — that the dark stuff on Vesta was volcanic basalts, that it came from dark asteroids made up of carbon and primitive organic materials, or that it was "shock-melted and darkened" material melted on the surface from the heat of asteroid impacts, McCord said. "All of that is consistent, but it doesn't [definitively] prove carbonaceous chondrite material," he said. "There are pieces of material, and there is no evidence of any other source that we can think of, at least." At 325 miles (523 km) in diameter, Vesta is big enough to have experienced some of the stages of planetary evolution. 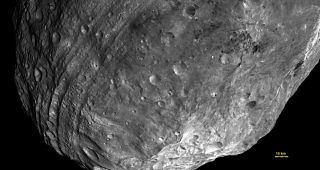 For example, when Vesta was formed, it melted and heavier materials sank towards its center, similar to how our dense core formed on Earth. By contrast, most asteroids are loosely held collections of rubble. An asteroid slamming into Earth's moon tends to see most of its materials ripped off as it crashes into the surface. But Vesta's weak gravity compared to the moon, and lower relative velocity with respect to the asteroids hitting it, makes impacts happen more slowly. The dark asteroid materials we see scattered on Vesta's bright basalt surface could have implications for how life got started on the Earth. McCord cited a long-standing theory that the Earth's water and organic material could have come from asteroids or comets elsewhere in the solar system. "We have, apparently, a dramatic example of the surface of an object being contaminated by material from other objects," McCord said of Vesta. "It forces one to [suppose] most objects are contaminated this way, and this is the way the Earth got its water and organic material. It not only has implications for the surface of Vesta, but for most other airless inter-solar system objects." NASA's Dawn spacecraft arrived at the giant asteroid Vesta in July 2011 and is set to depart on Sept. 4, 2012 PDT (Sept. 5 EDT). In a separate paper published in the same issue of Nature, researchers examined why "space weathering" from solar and cosmic radiation, as well as micrometeroid impacts, is not seen on the surface of Vesta. McCord was a co-author of the study, which was led by Brown University's Carle Pieters. Vesta's surface churning appears to be due to asteroids hitting its surface, rather than traditional space weathering. This makes it different from other airless bodies such as the moon, which has a higher gravity that makes asteroids slam into its surface faster, and the asteroid Eros, whose gravity is so weak that it cannot retain impact material as well as Vesta. According to the paper, the new finding means the concept of space weathering extends beyond micrometeroids and solar wind to include the dynamic mixing process of surface particles.